Massachusetts State Route 122A runs in an angle from the southeast to northwest in Worcester County. It goes from Grafton to Rutland. MA St Rt 122A passes through the following towns in Worcester County. MA St Rt 122A is multi-plexed in Worcester County. Massachusetts State Route 146, from near Millbury to Worcester. Massachusetts State Route 122, at Worcester. Massachusetts State Route 9, at Worcester. 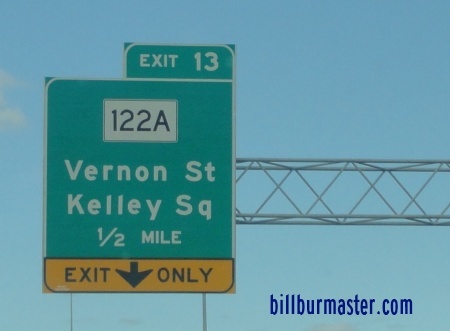 Massachusetts State Route 12, at Worcester. Massachusetts State Route 56, near Rutland. 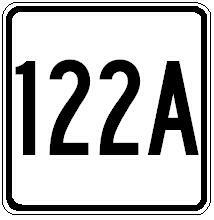 MA St Rt 122A intersects the following highways in Worcester County. Massachusetts State Route 122, at Grafton. Massachusetts State Route 146, near Millbury. Interstate 90, (Massachusetts Turnpike) near Millbury. U.S. Rt. 20, near Millbury. Massachusetts State Route 146, at Worcester. Massachusetts State Route 31, at Holden. Massachusetts State Route 68, near Jefferson. Massachusetts State Route 56, at Rutland. Massachusetts State Route 122, near Rutland. A BGS on NB I-290.